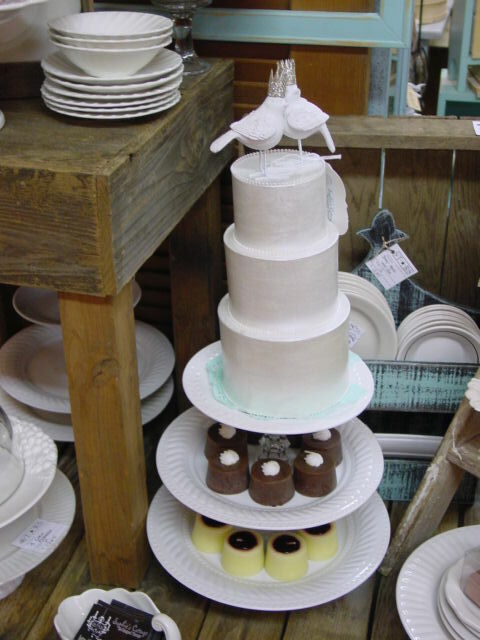 Whilst in the midst of my recent white cake and dessert pedestal making binge, it struck me that they would ‘display’ much better (in my booth at Stars AND in the pictures in my etsy shop!) if I could show them ‘being used’. 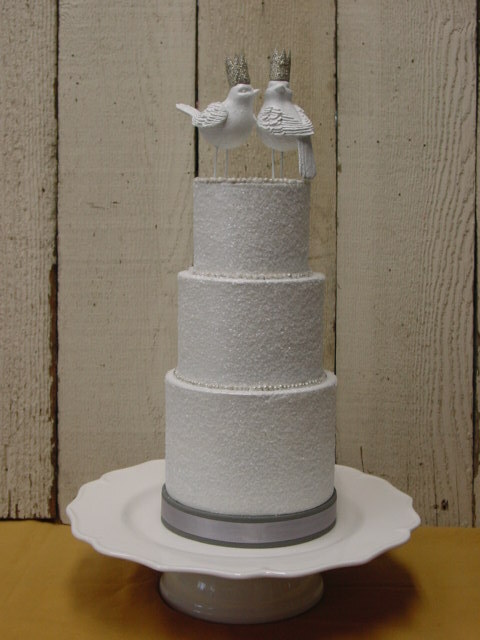 So I set out to hunt down something that I could make a fake wedding cake from. I’ve seen some AMAZING ones for sale on etsy, but I wanted to make my own. 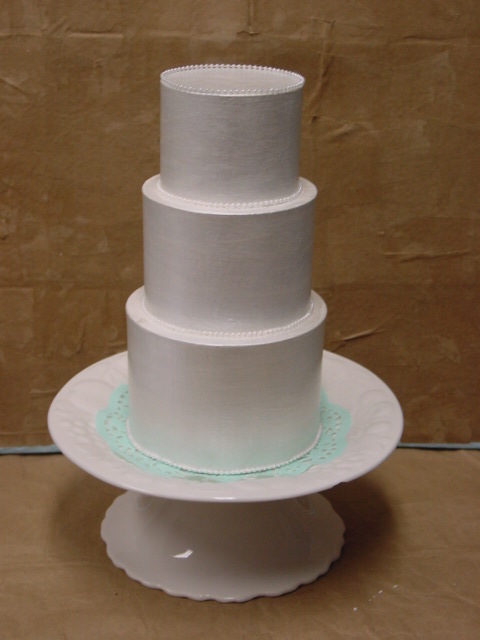 Some of my favorites are these hand SEWN felt cakes. 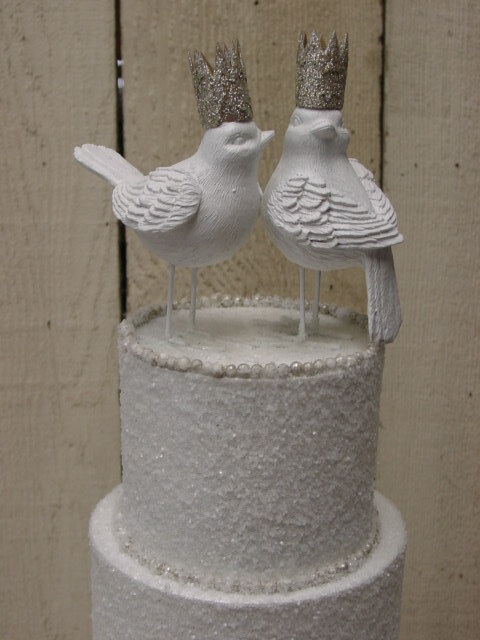 SOME day I will venture into making something like that! But for now I needed something a little faster to construct. I found some paper mache boxes and went to work! 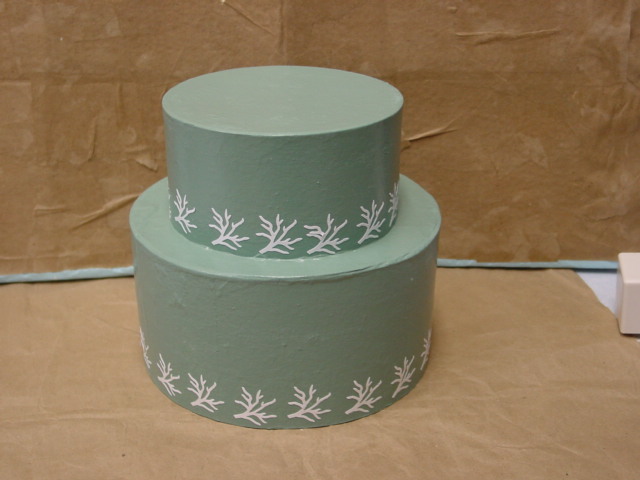 To create this one, I used a set of two round paper mache boxes (without the lids!) and glued them together. Once dry, I painted them. 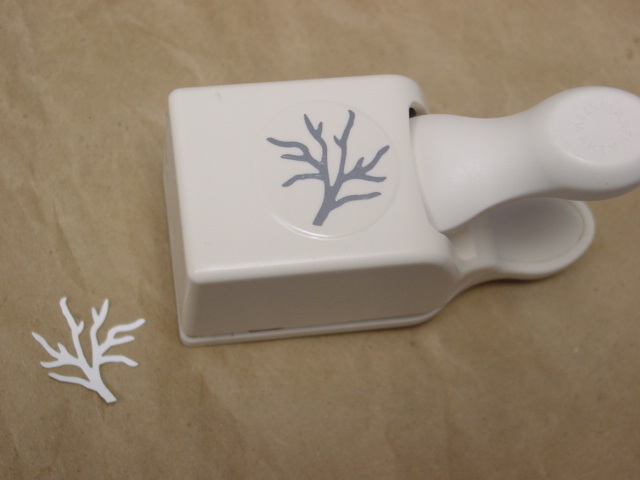 Then I added some coral shapes, die-cut from cardstock. 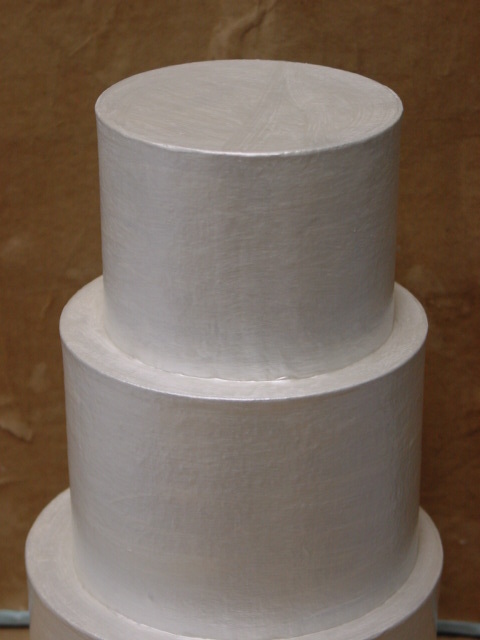 Applying glue to the backs of, and applying them to the cake was probably the HARDEST part of this whole project! 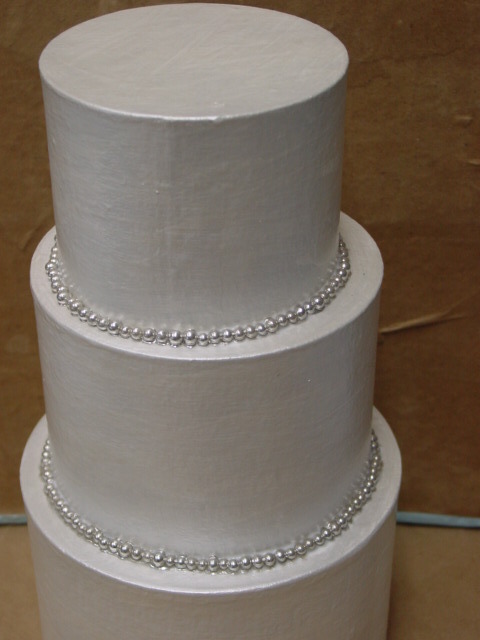 At the same time, I was working on a couple of smaller, three tier boxes that I wanted to make into wedding cakes. Painted a shimmer white. And on ONE I added a ‘trim’ of vintage ‘silver dragees’ (that’s what the label says!) ALMOST (but not quite!) 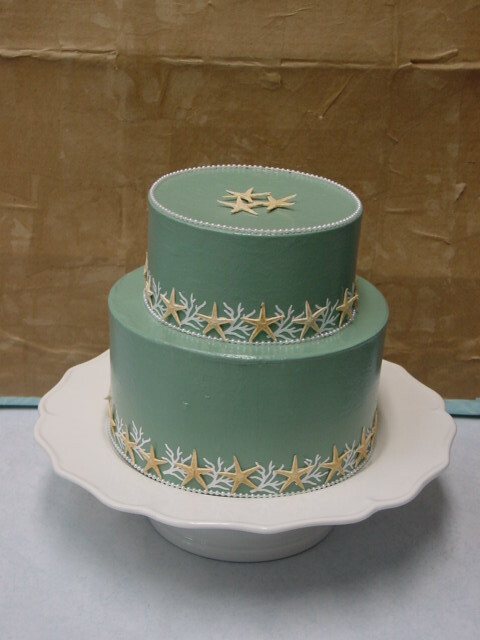 as difficult as gluing on the paper coral pieces on the green cake! I applied my bead of glue, then placed the dragees in a line. But the glue melting off the silver! sigh. I had too many in place to change my mind at that point, so I had to continue! A~HA!!!! Now that’s better! 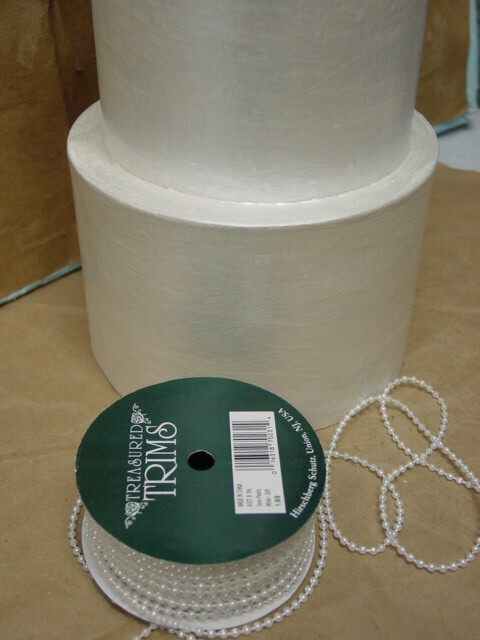 I found some tiny pearl trim to use on the other wedding cake! Just measured out my pieces and cut to size. Applied a line of glue all the way around, and gently laid the pearls in the glue and pressed them into place. The TOP row was the most difficult, as I didn’t have the extra support of another layer holding it in place from behind. Had to let this glue ‘set up’ a bit so it grabbed the pearls better. Then I just sat and watched for about 30 minutes while it dried; and pushed any that started to slide off back into place. 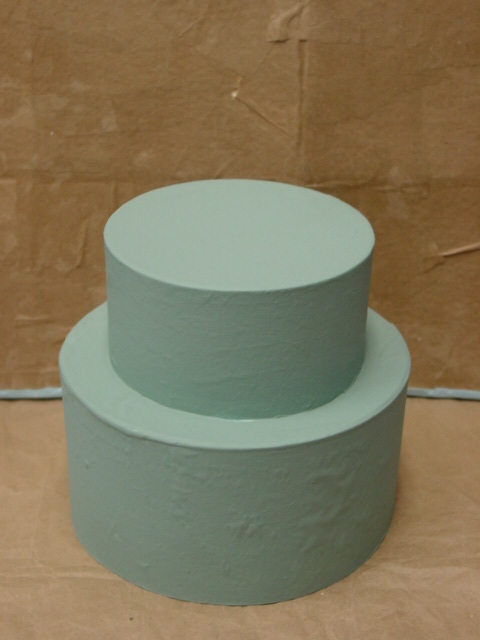 Just ‘testing’ to see how well they fit on the cake pedestals I had made. 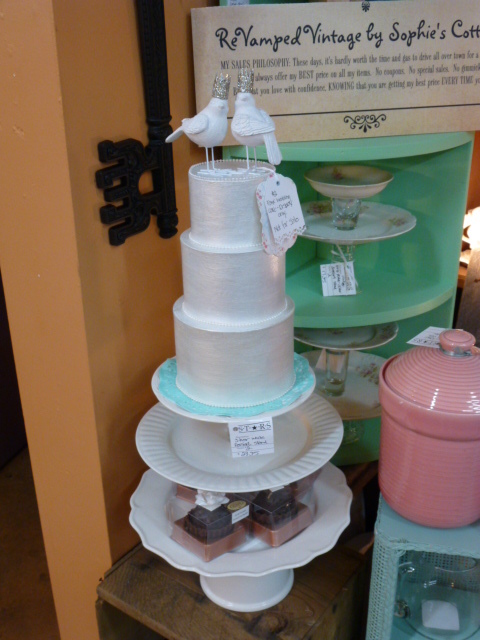 LOVE those aqua doilies I found at Michael’s a while back! 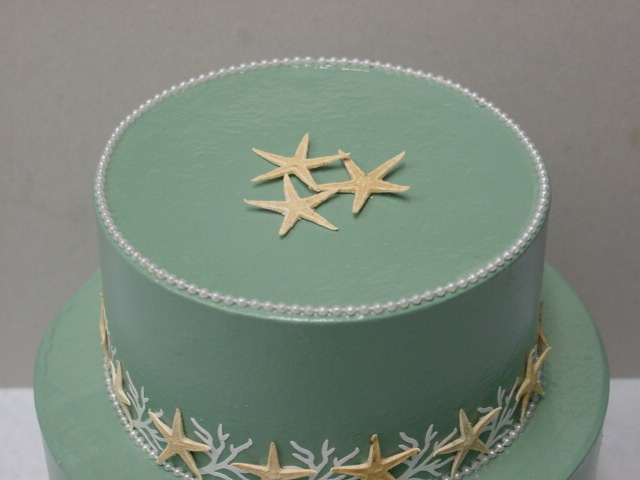 And I decided that pearl trim would work on the beach themed green cake too. 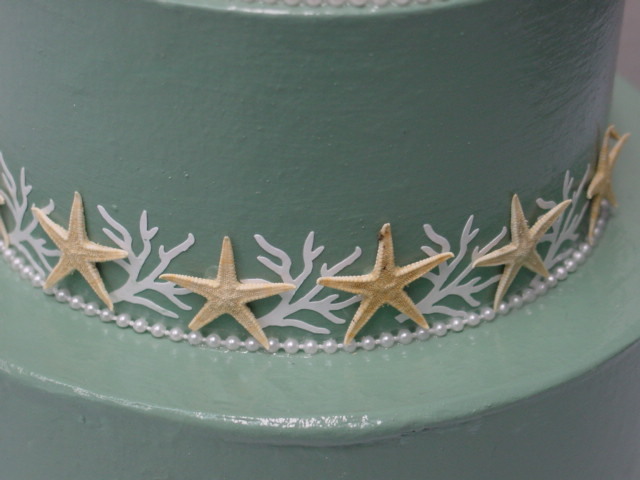 After the pearl trim was dry, I added some tiny dried REAL starfish in-between the paper coral on the sides. And a few on the top for the finishing touch! A sprayed on clear top coat to make it easier to dust and I’m done! 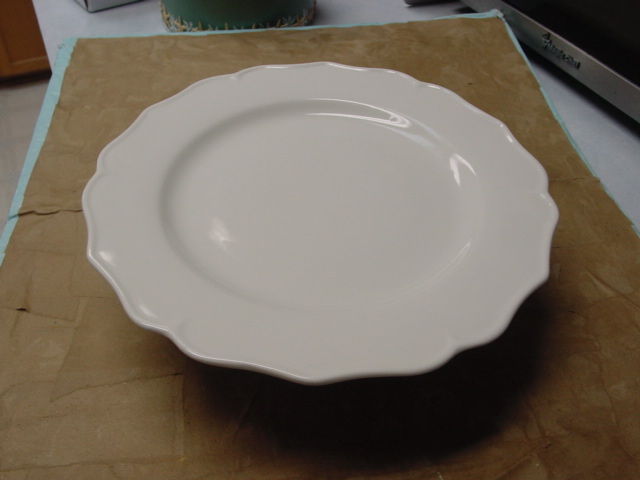 Perfect fit on this 8″ cake plate with a 2″ rim. 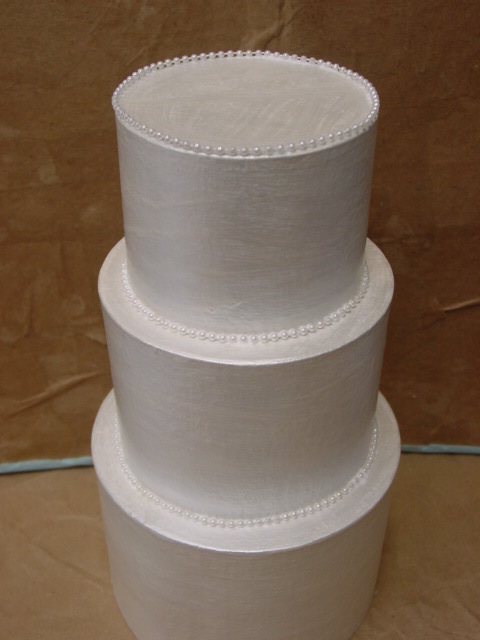 For the three tiered wedding cake that I’d glued the silver dragees onto, I decided to add a ‘sugar’ coating (clear white glitter) And I painted the lid to the largest box, added some satin ribbon and glued it to the bottom layer for some additional support. Then I decided that they could serve DUAL functions! 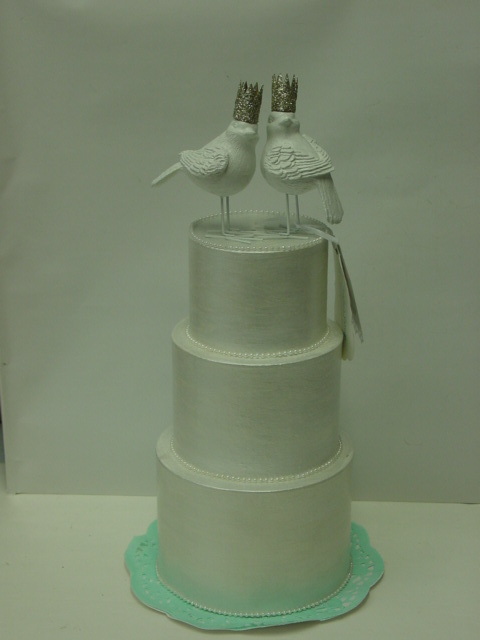 To display ON my cake pedestals. 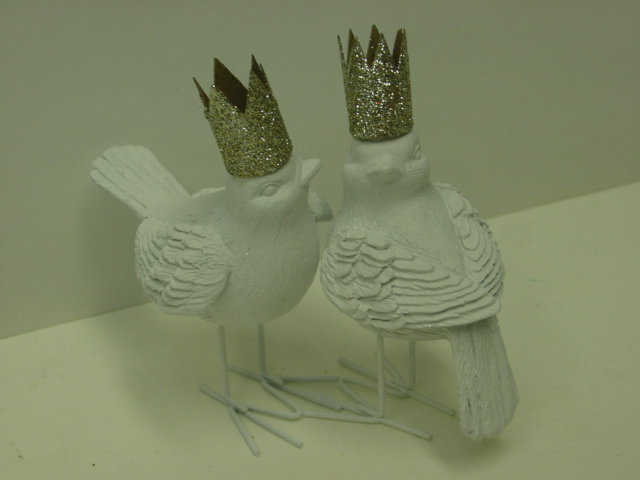 And to display the little birds with crowns cake toppers I was selling. 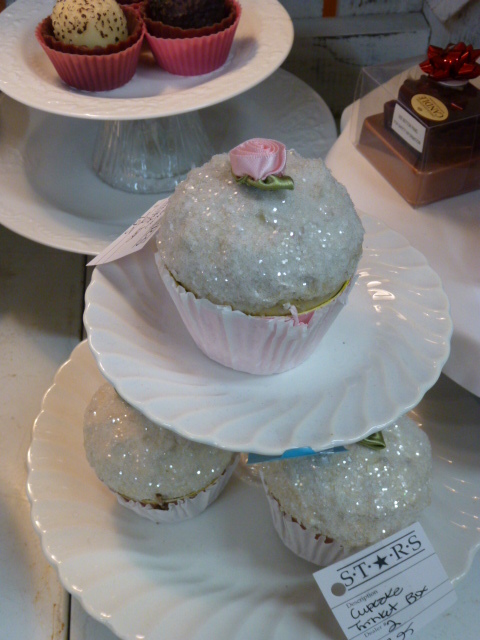 I also re-did a few of the cupcake trinket boxes, adding ‘sugar’ glitter to the top and some little ribbon roses.